Babe Ruth was born in 1895, in Baltimore, MD, in a tiny row house near the site of the original Orioles ballpark. In the late 1960’s, this house was still standing in the old Ridgely’s Delight neighborhood, a few blocks from the Inner Harbor that would eventually be redeveloped in the early 1980’s and become a tourist attraction. This house was also scheduled for demolition in the late 1960’s, until a group of local Babe Ruth fans and Baltimore history buffs put a stop to the plans and convinced the city to support a museum in Babe’s honor. 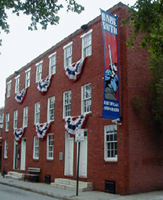 The non-profit Babe Ruth Birthplace Foundation opened the Museum in 1974. In 1983, the Museum also became the official museum for the Baltimore Orioles, followed by the Baltimore Colts in 1985. Ironically, though, in the early 1980’s, the Babe Ruth Museum was also financially struggling, due somewhat to a lack of up-keep and proper marketing which would drive strong attendance and generate sufficient funding to ensure ongoing maintenance of the building and its facilities. In 1983, Mike Gibbons, a local Baltimore documentary producer who was conducting research on the Babe, had agreed to assist the organization to ensure the preservation of Ruth’s birthplace. Over the course of a year, Mike’s turn-around of the Museum was already apparent and the members of the organization asked Gibbons to stay on as its Executive Director. 23 years later, Mike Gibbons is still Executive Director of the Babe Ruth Museum. Over time, through the efforts of Mike, his dedicated staff, the Museum’s Board of Directors, local and state government and other passionate Babe Ruth fans, the Museum has been preserved and interest, as well as exhibits have flourished. In the 1990’s, the Babe Ruth Museum also became the home to the vast memorabilia collection of NFL quarterback legend and Baltimore Colts star, Johnny Unitas. With the opening of Orioles Park at Camden Yards, just a few blocks away, attendance at the Museum steadily rose and now exceeds 60,000 annually. Through the 1990’s, the Museum flourished, adding more memorabilia and important archives to its collections. It became clear that an expansion was needed and plans were made. These plans came to fruition in 2005 with the opening of a larger sister site, known as “Sports Legends at Camden Yards”, in the old, extensively-renovated, B&O Railroad Station next to Orioles Park. This facility now houses the Orioles Hall of Fame, the Maryland Collegiate Hall of Fame and Johnny Unitas’ collection, among others. It, of course, also has exhibits on the Babe, as well. Given that Johnny Unitas and the Baltimore Orioles collections have moved to Sports Legends at Camden Yards, the Babe Ruth Birthplace and Museum now has the opportunity to make some changes of its own. As of Fall 2006, the original museum that was Babe’s birthplace, will soon begin a major renovation to increase exhibition space, upgrade portions of the 19th century building, and install ramps and an elevator for handicap accessibility. With these changes which are expected to last just over six months, fans will see a greatly updated and enhanced facility which will include items never on public display before, new multimedia exhibits and general infrastructure enhancements. Fans can contribute to renew and refresh the Babe Ruth Birthplace and Museum, making this mecca for fans of baseball, Babe Ruth and history an even greater place. In the summer of 2006, Mike Gibbons, Executive Direction, said: “What we’re asking fans this to do this summer, this baseball season, is to join our 714 club where they can help with the renovation to help us preserve Babe Ruth’s legacy by contributing $7.14 or $71.40 or you move the decimal point, to help with the renovation.” BRC strongly supports this effort.